By providing answers on your blog, you will attract new visitors to your website, and if they’re interested in what your blog has to offer, chances are that they are interested in your services as well and can easily be converted into leads. Blogging will increase your online presence, thus improving your SEO (search engine optimization), ranking you higher on search engines such as Google. Blogging also provides more pages to be linked to from outside sources and to be shared on social media. You can promote offers on your blog related to what you are writing about- when visitors come initially to read what you have to say, once they’re on your website, you can lead them towards the next step of becoming a lead or a customer. 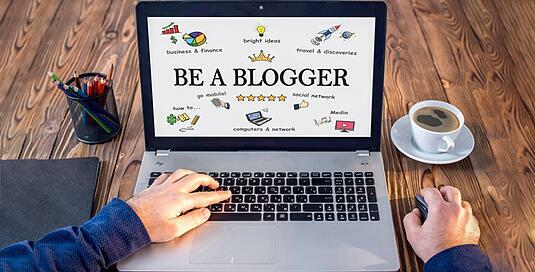 By blogging, you pave the way to being recognized as an expert in your field. Okay, So How Should I Do It? In regards to the actual text, you’re going to need to take care of that yourself. I can’t help you there, sorry! But I can share some tips with you to get the most out of your carefully-crafted piece. Yes, you probably know a lot about your field, and you may want to share that. However, it’s best to stick to one topic per blog, the more specific the better. When a topic is specialized, it makes it easier for search engines to track, and it’s more likely to give readers what they’re looking for. So what to write about? Focus on providing answers to questions your target market or buyer personas may have. You may want to research what other people in your industry are talking about, or base an article off of questions you’re frequently asked about your product or service. Don’t forget about keyword research. You’ll want to take into account what people are searching that you have the skills to address. Choose one longtail keyword (a specific phrase, like “girl’s gold-plated dangling earrings”, instead of “kid’s jewelry”) to include in your title, url, image alt-text, headers and text body. Speaking of titles, remember that it is the first thing readers see, and they may choose whether to continue reading based off of that title, so choose wisely! Make sure it is specific and true to the article, and also tells the reader what he or she will get out of reading it. Just be sure that the title isn’t too long - otherwise, it can get cut off in search engine results. What readers are looking for in a blog post is something simple to read and easy on the eyes. Most people don’t spend the time reading a full article; instead, they’ll most likely skim the parts that stand out. Ensure that scanners get the main idea by making clear headers and bolding important text. Consider adding bulleted or numbered lists as well. Also be sure to leave lots of white space between paragraphs and along the sides, to make your page pleasing to look at. Another important piece of the layout is including images. They provide a visual way for readers to understand what you’re addressing, and they also break up the text, making it easier to digest. This is a great chance to promote offers you’ve been trying to market. Include calls-to-action in the body, bottom, and sides of your text. A call-to-action, or CTA, is a button promoting an offer, such as an e-book, white paper or checklist to be downloaded. You can also include passive CTAs through hyperlinked texts towards the beginning of the blog post (who reads a full blog, anyway). Just make sure the promotion that you are offering is related to what you’re writing about. Congrats on the great blog post! Now all you need to do is get the word out. But how? Be sure to make a space on your website for your blog, and include it on your main navigation so that it is easy to find. Include some most recent blog posts on a sidebar of your homepage, and possibly of other pages, too. Link internally, from other web pages or related blog posts. Share your new post on your social media. Include social sharing buttons on the article’s page so others can share as they wish and do promotion for you! If your post is still relevant months after you’ve initially published it, feel free to share it again on social media (just take care to change the wording and shake it up a bit). Email your contacts when a new post is published, or create a weekly or monthly digest of new blog posts for them to check out. Keep in mind that readers want to see quantity, so make sure to start off with a few posts at once so that the space seems full and utilized. There you go, you’re all set! See you over at your blog!